Born: Kiel, 15 September 1979. Grand-Prix: 2000, 2001, 2002, 2003, 2004, 2005, 2006, 2007, 2008, 2009, 2010, 2012, 2013, 2014, 2015, 2016, 2017, 2018. Challenge: 2006, 2008, 2009, 2012, 2013, 2015, 2016, 2017. Qualifying Round: 2014, 2016, 2017, 2018. Grand-Prix: First St. Macaire 2007, Pfarrkirchen 2010, Marianske Lazne 2010, Vechta 2011, Second Marmande 2014, Muhldorf 2017, Third: Marianske Lazne 2011, Morizes 2011, Morizes 2012. Challenge: First 2009, Second 2013. Qualifying Round: Second 2016, Third 2004. First 2007, 2008, 2010, 2011, 2012, 2014, 2017, Second 2015, 2016. First: 2006, 2009, 2012, Second: 2007, Third: 2015. Finalist: 2002, 2004, 2005, 2008, 2010, 2011, 2013, 2017, 2018. Semi-final: 1999, 2003, 2006, 2015, 2016. Semi-final: First 2006, 2007, 2009, 2010, 2011, 2012, Second 2004, 2005, 2014, Third 2017. First: 2010, 2011, 2017, Second: 2007, 2009, 2016, Third: 2001, 2004, 2006, 2015. Other Appearances: 1999, 2000, 2002, 2003, 2005, 2008, 2012, 2013, 2014, 2018. German Silver Helmet Winner: 2011, 2012, 2013. 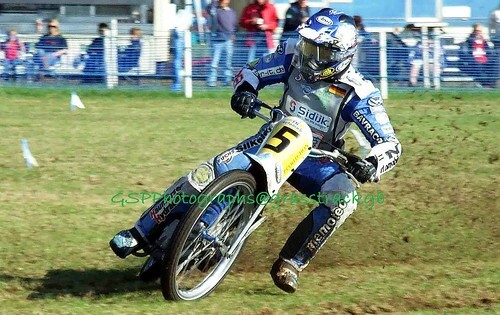 German Longtrack Golden Helmet Winner: 2011. North German Longtrack Winner: 2012, 2013, 2014, 2016. German Longtrack Silver Helmet Winner: 2010, 2011. Czech Longtrack Championship Winner: 2016. Golden Pheasant Winner: 2005, 2009, 2010. Teterow Bergring Cup: First 2015. Silver Rose: First 2013, Second 2011. Golden Roman Second 2010, 2011.